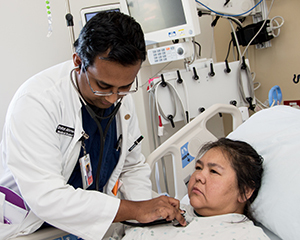 The College of Medicine – Phoenix offers a wide variety of fourth-year electives that are designed to meet curriculum and graduation requirements. Electives are provided through Phoenix-area and out-of-state hospitals, medical centers and private practices. There are also many opportunities statewide, nationally and internationally. Choose from all available electives. May include research, “away,” independent study or Global Health electives. Maximum of two fourth-year courses may be two credits. No electives may be 1, 3 or > 4 credits. Maximum number of credits allowed in one subspecialty field is 12. Maximum number of credits not directly supervised by University of Arizona College of Medicine – Phoenix faculty is 16. Maximum number of non-clinical credits is 8. Any exceptions to these policies must be approved by the Electives Director, the Associate Dean of Student Affairs and the student's advisor.